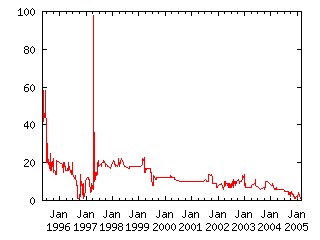 A stable transuranic isotope will be discovered before 12:00 Midnight, GST, January 1, 2005. "Stable" will be interpreted as having a halflife of more than 1 million years. A judgement of 0.50 to both YES and NO will be given if an element is discovered with a halflife of more than one year, but not one million years. It is estimated that, because of the "Magic" numbers for nuclear particles, that an element around #114 should be somewhat stable. This could be formed by bombarding Plutonium with Calcium. Berkeley labs in California and some labs in France are working on this element right now. Technical Background: "Super-Atoms and Mystery Particles", by John G. Cramer, published in "The Alternate View" column, Mid-December-1986 issue of Analog Science Fiction & Fact Magazine. Clarification: I intend to abide by the "Standard Ambiguity Clause" currently in development. As of this writing it reads, "If the wording is found to be ambiguous I will judge on the basis of the obvious intent. If the intent is ambiguous I will judge on the basis of precise wording. If both are ambiguous or if both are clear but in conflict, I will look for a solution that causes the least damage to FX as a market and game." I judge that the intent of this claim is obvious. Regardless, my solution to cause the least damage is 1) to make the judgment impartial by using an outside source as is often (but not often enough!) done here, and 2) to answer a specific question about the timeframe of the claim. FAQ: judgment will be based on the discovery being reported in 'Science News' (if that publication goes under, I will choose another). A retrospective on the discovery/manufacture of a known Neptunium won't count. A summary judgment on the basis of a rediscovery of a previously known stable transuranic element is explicitly ruled out. FAQ: the date of the aforementioned publication must be after the reported creation date for this claim. FAQ: if two or more such elements are discovered by the due date, the first one reported (in the aforementioned publication, even if they are reported in the same article) will be used to determine the amount of the payout.